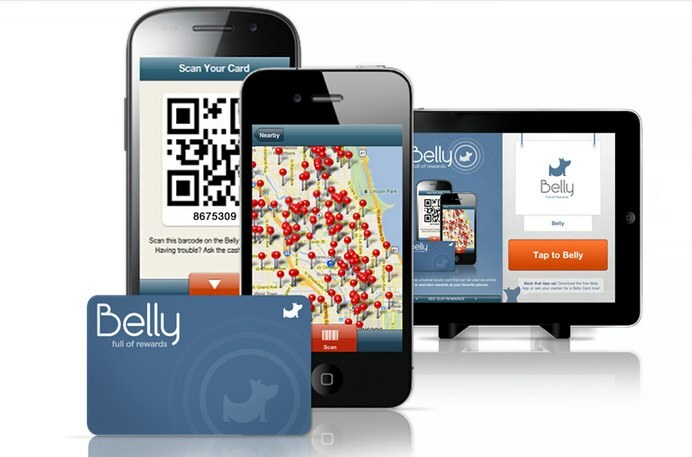 Chicago-based Belly, a startup that is a fast-growing contender in the local business customer loyalty and rewards space, has raised $10 million in Series B funding from Andreessen Horowitz. The company also announced that Andreessen Horowitz partner Jeff Jordan, former chairman and CEO of OpenTable and former president of PayPal, will join the Board. This latest round of funding adds to a seven-figure round raised by the startup from Lightbank, the venture firm founded by Groupon co-founders Eric Lefkofsky and Brad Keywell. Belly wants to reinvent customer loyalty rewards through gamification, digital check-ins and a iPad setup for businesses. But the startup has a slightly different take on how to achieve this. Belly offers a quick-setup, plug-and-play rewards platform to merchants. Part of this is an in-store iPad (which Belly supplies) that is used to validate paying customers right at the point of sale, and serves as a check-in point. Belly will also train employees to encourage them to participate in the program. Merchants pay a monthly subscription for unlimited Belly cards to hand out to customers, in-store marketing materials and secure access to customer data that reveals sales, points and redemption data, as well as insights into foot traffic and card usage patterns. Businesses can even use Belly data to send out push-notifications about exclusive promotions and other rewards to Belly customers. On the consumer side, to check in, customers can scan their smartphone at an in-store iPad POS and with each check-in, you get closer to a specific milestone, and reward (as stipulated by the business). 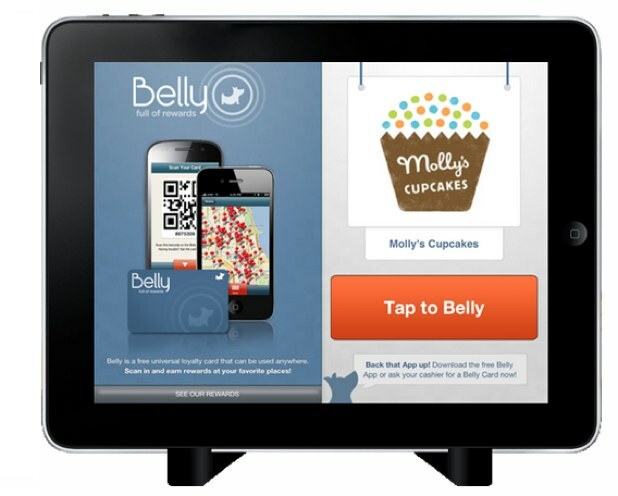 You simply scan a Belly card (provided by the merchant), or use Belly’s iPhone or Android Apps on the businesses’ Belly iPad app (which sits next to the register). Once you check-in you accumulate points, and can start earning rewards. On the Belly mobile apps themselves, you can simply open the app and see a list of merchants that are Belly users by your location. The app completely replaces the merchant card at all of these businesses. With the Belly card, you have one universal rewards card (that is attached to your email) which can be used at all participating Belly merchants. The premise, says co-founder and CEO Logan LaHive, is that consumers don’t want to carry several different cards, and businesses need a loyalty system that everyone can use. “We’re eliminating overstuffed wallets,” says LaHive. He also adds that the talented team, elegant product execution with the iPad, and the backing from Lightbank all made the investment attractive for Andreessen Horowitz. In particular, Jordan feels that the loyalty market is fragmented and Belly is in a prime position to scale its business. Of course, as CEO of OpenTable, Jordan has insight on how to scale a business catering to small restaurants and merchants. He says that Belly will need to build a sales team, fast. “The key is to get in as many cities as fast as you can,” he says. Even in the past 9 months, Belly has been scaling fairly fast. Launched in August 2011, Belly has over 200,000 active users who have checked in over 800,000 times. Belly currently partners with 1,400 merchants and adds 100-plus new businesses each week. And starting today, Belly is available in New York and Boston, in addition to its existing roster of businesses in Chicago, Austin, Milwaukee, Madison, Wis., Washington D.C. and Phoenix. One of the differentiating factors for Belly from its many competitors, says LaHive, (which include LevelUp, Perka, PerkVille, and PunchTab) is that businesses are able to tailor their rewards program. Currently rewards at businesses range from a comic book store that offers customers a chance to punch the owner in the stomach, to a bakery that rewards customer 10 minutes of all you can eat cupcakes. You can arm wrestle a sandwich restaurant owner or ride along in a food truck that will let its best customers “egg” the truck as it drives by. Dog-A-Holic will post a “Portrait Of You And Your Dog On Our Wall and Red 7 Salon allows customers to “Shave Our Heads With A 1-On-1 Owner Buzz Cut.” Belly works closely with each individual business to ensure the rewards are unique and personalized to that business’ brand and culture. Another added bonus for businesses is that they can see when each customer is checking-in, how often and more. Businesses can get a clear view of their most loyal and valuable customers. another data area where Belly may expand into is transaction data. Currently the app doesn’t track what the customer actually bought but is looking to integrate with Point of Sale systems in the future. “We’re moving beyond the buy ten get one free program to work closely with each merchant to try to uniquely appeal to their customers,” says LaHive. “Businesses want to create personal relationships, and take what is offline and put it online, and analytics on how to manage customer behavior, communications tools, email and social media allows these business to have an ongoing relationship with customers. The new funding will be used to build and staff a larger sales team to expand to other markets. While many of these sales people will be based in Chicago, others will be located in the local markets as well. LaHive is also focused on product development and will be looking to transition all the startup’s apps to HTML5. The company will also being making a number of speed, and UI improvements as well as redesigning the experience.